Brunei is a tiny, independent, oil-rich country wedged between the states of Sarawak and Sabah on the Malaysian side (northeast) of the island of Borneo in Southeast Asia. Brunei is considered a "developed" nation, and thanks to an abundance of oil, continues to prosper. Public debt in Brunei is zero percent of GDP. As of 2014, public dept for the United States was 106% of GDP. The name Brunei Darussalam means "abode of peace" which is mostly true given the country's higher standard of living and longer life expectancy (average is 77.7 years) than many of their neighbors in Southeast Asia. In 2015, Brunei ranked higher on the Human Development Index (31st overall in the index) than all other countries in Southeast Asia aside from Singapore. 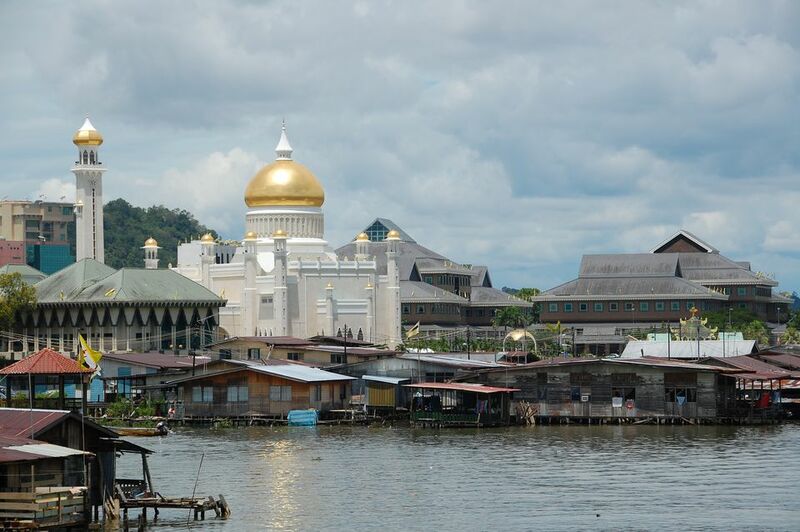 Brunei is considered to be the most observant Islamic nation in Southeast Asia. Beautiful mosques dot the country. Visitors are welcome inside of mosques outside of prayer times and with proper dress. Read more about etiquette for visiting mosques. Much of Shell oil comes from offshore drilling platforms in Brunei. The 2015 per-capita GDP in Brunei was US $54,537 -- ranking them 10th in the world. The U.S. GDP in 2014 was US $54,629. Citizens in Brunei receive free education and medical services from the government. Brunei has one of the highest rates of obesity in Southeast Asia. An estimated 20% of schoolchildren are overweight. The literacy rate in Brunei is estimated at 92.7% of the population. Brunei passed a law in 2014 making homosexuality punishable by stoning to death. In 2019, it was announced that these laws would begin to be enforced. Caning is still a method of punishment for crimes in Brunei. Brunei is just a little smaller than the U.S. state of Delaware. The sale and public consumption of alcohol is illegal in Brunei, although non-Muslims are allowed to bring up to two liters into the country. Eight days after the attack on Pearl Harbor, the Japanese attacked and occupied Brunei to secure a source of oil. Brunei has one of the highest car-ownership rates (roughly one car per every two people) in the world. Although the Federation of Malaysia -- which includes Brunei's neighbors of Sarawak and Sabah -- was formed in 1963, Brunei did not gain their independence from Great Britain until 1984. The Sultan of Brunei holds an honorary commission in the United Kingdom's Royal Air Force and Royal Navy. The Sultan married his first cousin, Princess Saleha. The Sultan's second wife was a flight attendant for Royal Brunei Airlines. He divorced his second wife in 2003 and removed her of all royal statuses. Two years later, the Sultan married a TV show host 33 years younger than himself. In 2010, the Sultan divorced the TV host and even took away her monthly allowance. In 1997, the royal family hired former Miss USA Shannon Marketic and a handful of other beauty queens to come model and entertain at parties. The women were allegedly forced into prostitution to entertain royal guests for 32 days. Despite having miles of beautiful coast, most travelers to Brunei only visit the capital city of Bandar Seri Begawan (population around 50,000). The roads and infrastructure in Brunei are excellent. Due to an abundance of oil and low fuel prices, local buses and taxis are the most cost-effective means of getting around. Brunei is typically a short stopover for travelers crossing by bus between the Malaysian Borneo states of Sarawak and Sabah. Nearby duty-free Labuan Island -- part of Sabah -- is an alternative route in and out of Brunei. Miri in Sarawak is the last major town in Borneo before crossing into Brunei. Travel in Brunei will be affected during Ramadan. Read about what to expect during Ramadan travel and important considerations for Ramadan. In July 2013, the population of Brunei was estimated to be only 415,717 people. The official language of Brunei is Malay, although it differs from the Bahasa Malay spoken in Malaysia English, and Chinese are also spoken in Brunei. English is understood and used widely for business. The currency used in Brunei is the Brunei dollar (BND). The U.S. embassy in Brunei is located in Bandar Seri Begawan. See a list of all the U.S. embassies in Asia.